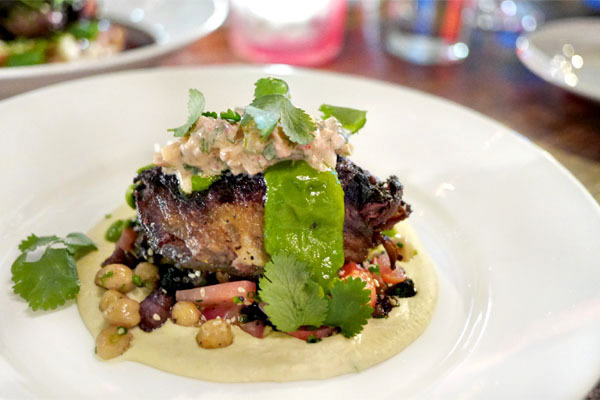 I closed out my short stay in Portland with a visit to Gabriel Rucker's Le Pigeon, a 36-seat spot in Lower Burnside known for the Chef's "haute comfort" creations. Since opening in 2006, it's sort of become the place to dine, a poster boy for the PDX dining scene that's mirrored the City's rise in our country's culinary conversation. About the Chef: Born in 1981, Gabe Rucker spent his childhood in Napa, California, the son of his machinist father Dave and elementary school teacher Laurie. Growing up, he didn't have the benefit of many home-cooked meals, and got his first culinary job in high school, making bagels at Kirk & Glotzer's NY Bagels in his hometown. After graduating in 1999, he enrolled at Santa Rosa Junior College and quickly got on the school's culinary arts track, but dropped out a year later. Rucker soon found employment at Napa's Silverado Resort & Spa, then made his way south to Santa Cruz when he was 20, landing a gig at Southern Exposure Bistro. He excelled there given the considerable creative freedom he was given, but would leave in 2003 for Portland. 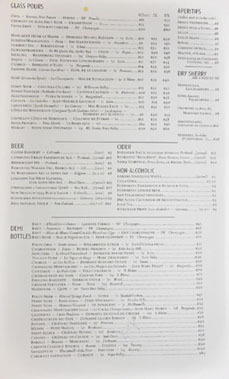 Rucker started working at Lazlow's, but only stayed a couple months before moving to Vitaly Paley's eponymous Paley's Place, where he worked the line for two years. In 2005, he became transitioned to Gotham Building Tavern, which is where he met his future sous Erik Van Kley, as well as his future wife Hana Kaufman. The next year, he cooked a brief stint at Cathy Whims' Nostrana before partnering with Paul Brady to revamp the ailing Colleen's Bistro on East Burnside. 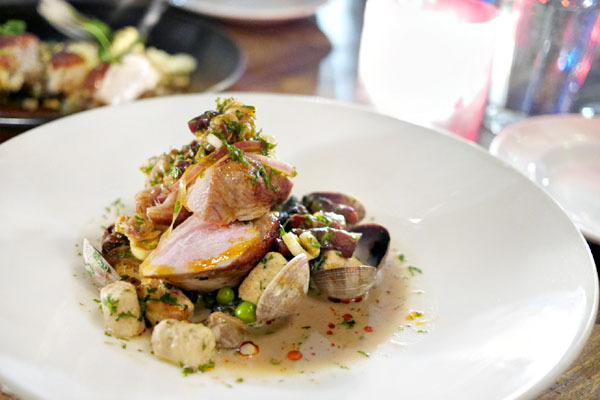 The restaurant was renamed Le Pigeon and debuted in June 2006, quickly becoming a hit with the locals, with Rucker garnering Portland Monthly's "Chef of the Year" and The Oregonian's "Rising Star" awards. 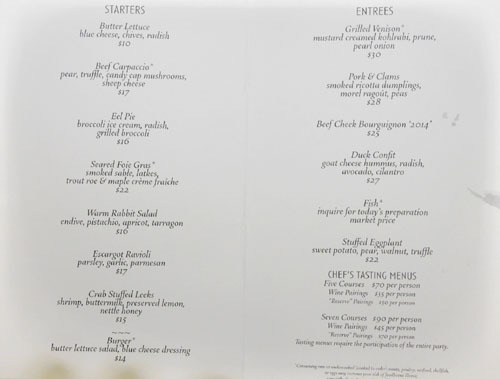 This was followed in 2007 by Restaurant and Hospitality's "Rising Star" prize, a nod from Food & Wine as one of "America's Best New Chefs," and the hiring of New Yorker Andy Fortgang as GM, who soon raised the level of service to something befitting the food. 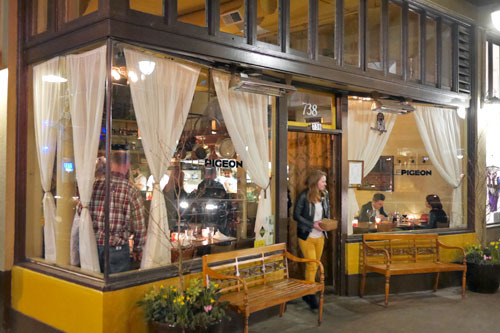 2008 saw Le Pigeon as The Oregonian's co-restaurant of the year, as well as Rucker's first "Rising Star Chef" nomination from James Beard, an honor he would repeat in 2009, 2010 (along with "Best Chef: Northwest"), and 2011 (when he would finally win). 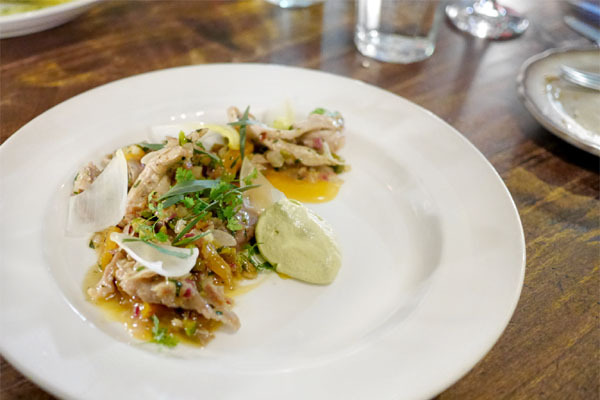 Given the success of his restaurant, the Chef opened his second place, Little Bird, in December 2010, a more straightforward French bistro helmed by his old sous Erik Van Kley. Last year, Rucker won another Beard, snagging the "Best Chef: Northwest" honor, and also launched his cookbook Le Pigeon: Cooking at the Dirty Bird, written in collaboration with Meredith Erickson and with photos by David Reamer (who cooked alongside the Chef in Santa Cruz). 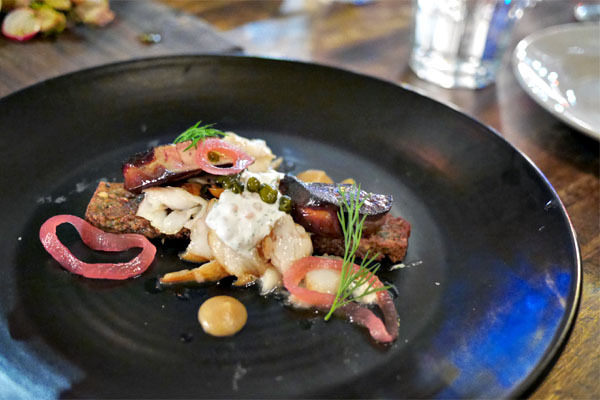 Le Pigeon's menu is short, and, it must be noted, not as offal-centric as it used to be, split simply between starters and mains, but with the option of either five- or seven-course tasting menus. 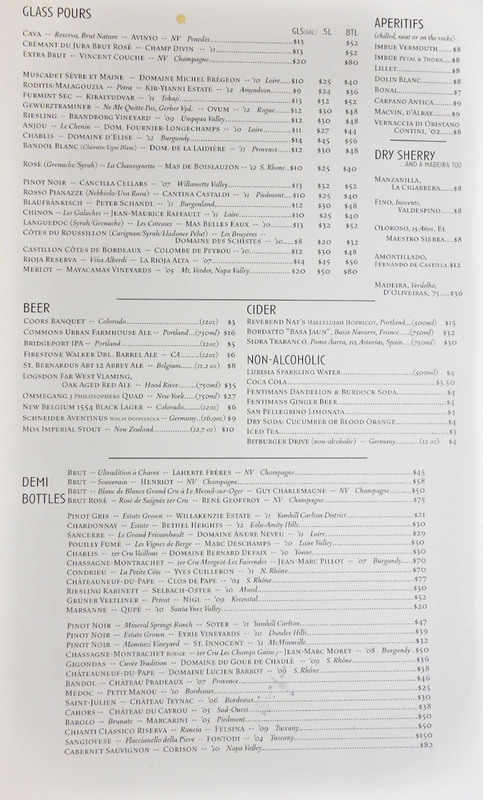 Given that it was our first time here though, we opted to order à la carte. 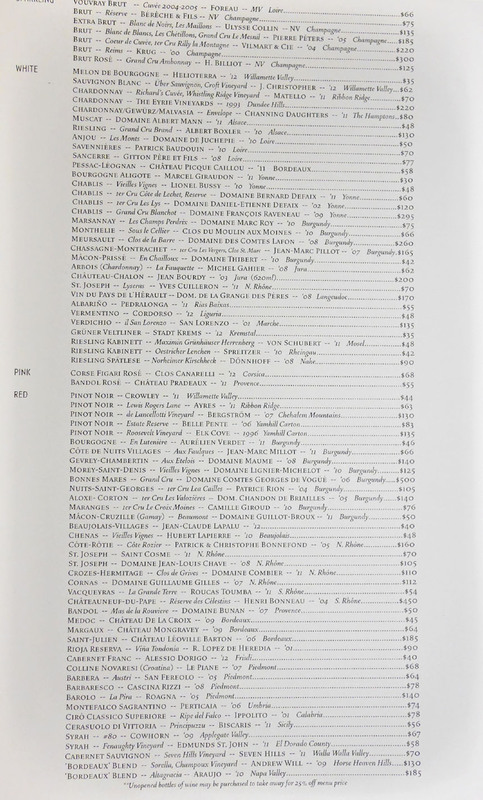 To drink, there's a pretty nice selection of wines, rounded out by some beers and ciders. Click for larger versions. 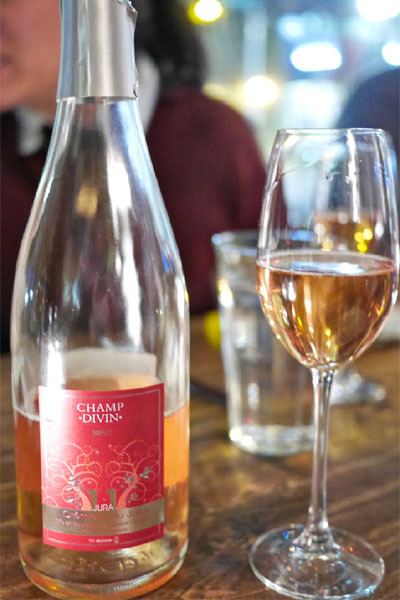 We mainly went for wine this evening, the first of which was the Crémant du Jura Brut Rosé, Champ Divin, '11 [$52]. It was a nice sparkler, crisp and dry, with a tingly effervescence and a base of red berries that made it a fun start to the meal. 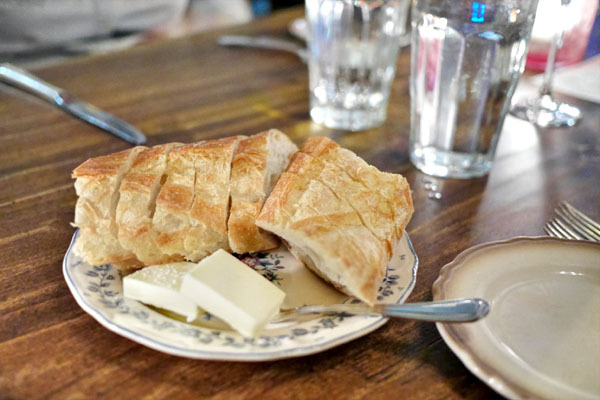 Bread was nothing out of the ordinary, but did the job, and functioned as a fitting pair to the salt-laced butter. 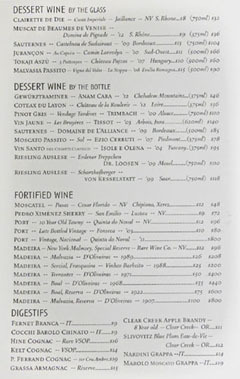 We began with a recommendation for our server. Crab was delectably sweet, pairing beautifully with the savory bits of shrimp strewn around, and working as a great complement to the astringency of the leeks. I liked how the lemon contributed a sort of overarching tartness that tied everything together--a promising beginning. 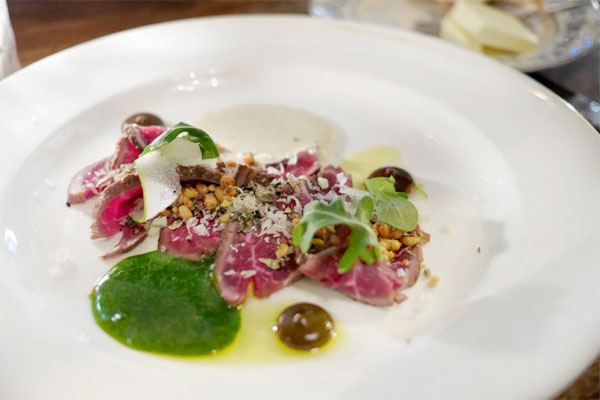 The carpaccio sounded neat on paper, but was unfortunately the weakest course of the evening. It just wasn't very "beefy," so to speak, with the goodness of the meat a bit lost among all the competing flavors of sweet and bitter on the plate. 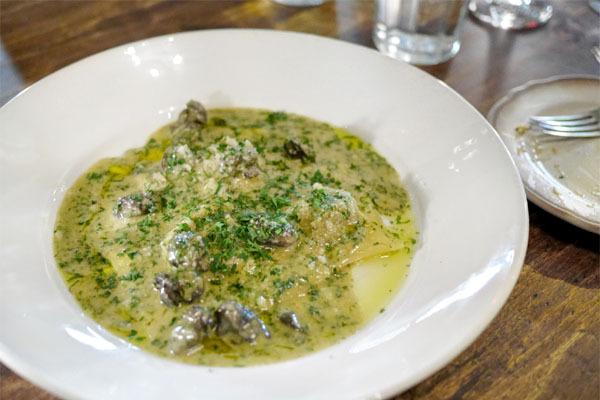 I'm a sucker for anything escargot, and this didn't let me down, giving up and the classic, buttery, garlicky, tangy flavors that you'd expect over the earthy weight of the snails, but in a new pasta form. The rabbit was also a bit of a letdown. I enjoyed the crunch and bitterness of the endive here, played against the sweet-nutty notes present, but again, I wanted to have the rabbit more readily apparent. 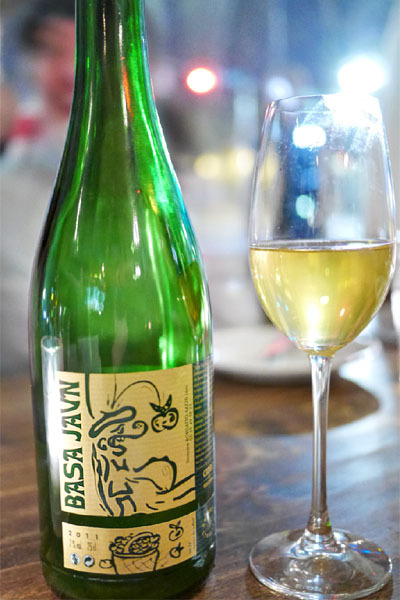 With the bubbly all drunk up, we moved on to cider, specifically the Bordatto "Basa Jaun", Basse Navarre, France [$32]. Now this was my kind of cidre, the dry and fizzy type with notes of sweet apple initially that led to a biting, focused funk toward the back end. 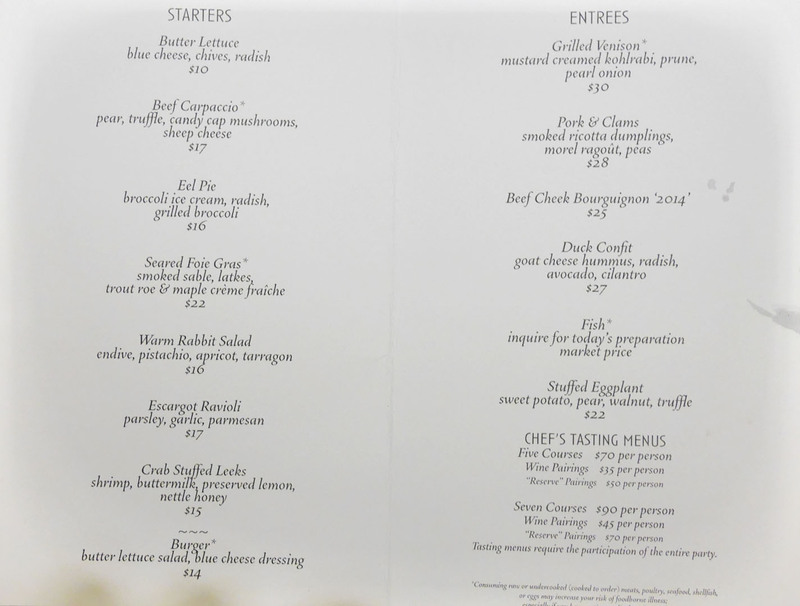 The name "eel pie" may sound off-putting, but the dish was undoubtedly one of the highlights of the night. The pie portion itself really showed off the hearty savoriness of the fish, paired with a wonderfully crisp crust. The charred veggies formed a great counterpoint in the course, but what really made this special was the use of broccoli ice cream, which added a pretty awesome temperature contrast to the mix. This was another favorite of mine, coming out much better than I thought it would. The richness of the foie was perfectly balanced by the crisp, savory potato, while the sable and roe imparted a smoky, saline temper to the liver. Rounding things out was just the right amount of sweetness from the maple syrup--a beautifully integrated course, and one of the best renditions of foie gras I've had in recent times. Moving on into the main courses now, we commenced with the special of the evening. 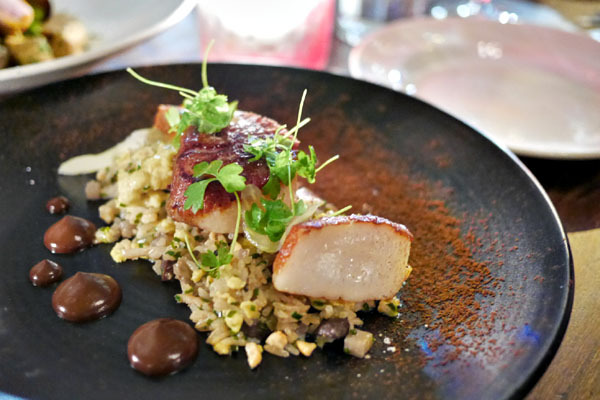 Scallops were deftly prepared, coming out salty and supple, with great caramelization. I was a fan out of how they went with the briny flavors in the fried rice, and how the dish in general had a sort of familiar Asian-y flair to it that was strangely comforting. Pork was beautifully done, arriving super succulent, flavorful, and just the right amount of peppery, standing its ground against the earthy weight of morel. The bacon-y, spicy, savory broth further enhanced the heft of the dish, and I was really into the moderating effect of the gnocchi and peas here, too. Very nice. 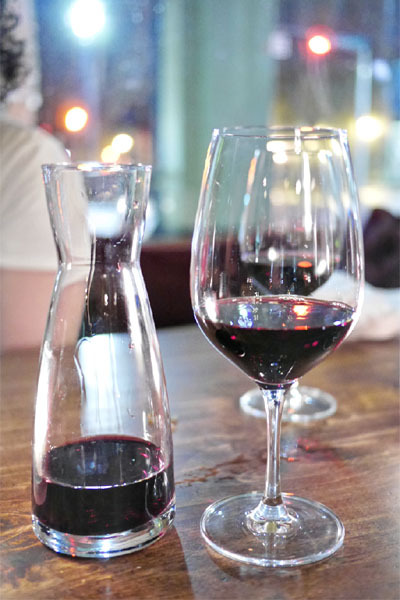 Our final beverage was a half-liter carafe of the Blaufränkisch, Peter Schandl, '11, Burgenland [$30]. Blaufränkisch is a varietal I don't get to have all that often, but I quite liked it here, finding the wine peppery, herbaceous, and light in body with a somewhat pronounced tartness and acidity. Getting into the heavier stuff now, the duck was yet another favorite. The bird itself was spot on: tender, juicy, bursting with flavor, and finished with a delightfully crisp crust. 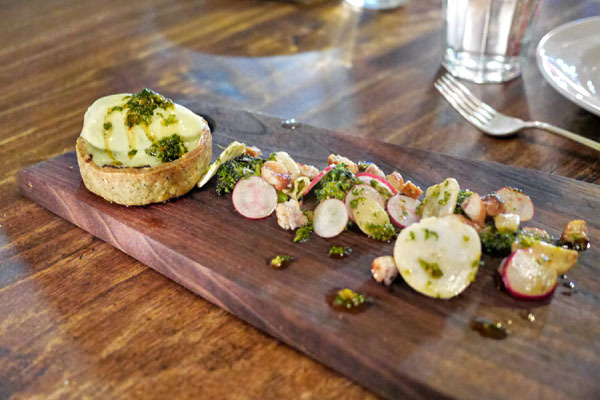 Add to that the lush brightness of avocado, the moderating heft of garbanzo, and verve of radish and cilantro, and you get a fantastic interplay of differing tastes and textures that really came together. 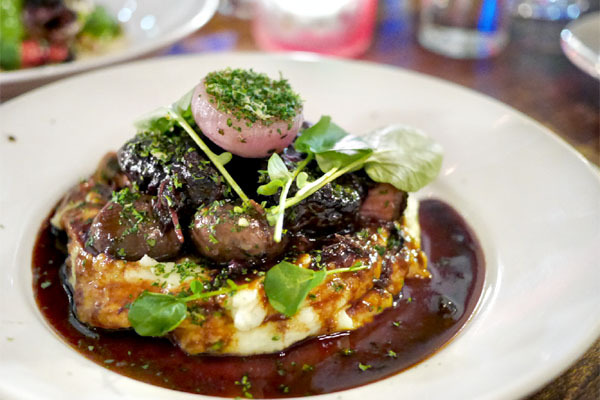 We ended our savories with one of Le Pigeon's most well-known dishes, the ever-changing bœuf à la Bourguignonne. It was a worthy pièce de résistance this evening, coming to us as deep, dark, and tender as one would expect, a celebration of bovine goodness mercifully evened out by the inclusion of onion, button mushroom, watercress, and especially those sour cream potatoes. If you haven't been here before, you should probably order this. 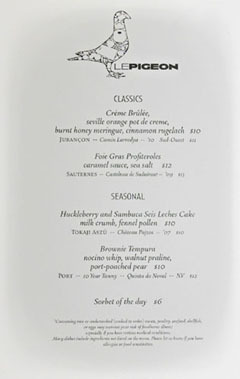 Dessert at Le Pigeon is the handiwork of Pastry Chef Lauren Fortgang (née Dawson), who, indeed, just happens to be married to GM Andy. Fortgang also heads the pastry kitchen at Little Bird, and previously, worked at Paley's Place as well as Hearth and Craft in New York. 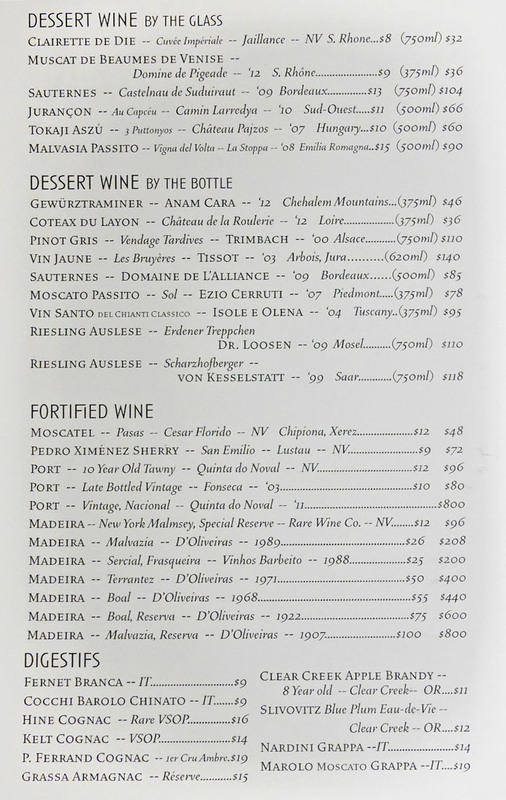 She has a short menu of items here, split between seasonal and classic selections, joined by a surprisingly long list of dessert wines (which includes, among other things, Madeira from 1907). 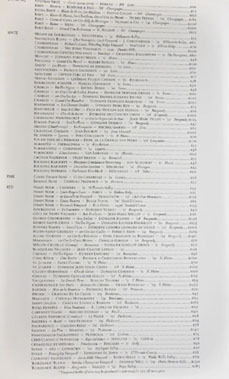 Click for larger versions. 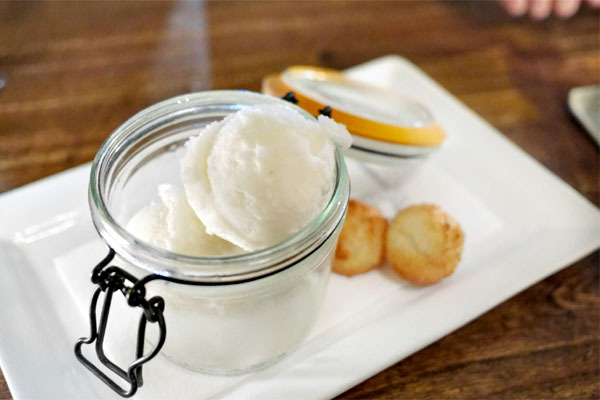 We started with one of her rotating selections of sorbet, this particular example showing off tart notes of lime on the attack before transitioning to sweet, fruity banana nuances toward the end. 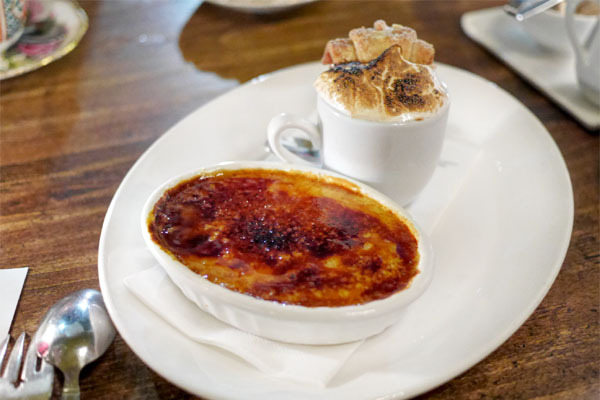 Le Pigeon's crème brûlée was classic in essence, replete with a wondrously bitter, crunchy caramelized top hiding a layer of creamy custard. Off to the side, meanwhile, was a pot de crème that was super tangy, really displaying the bittersweet nature of the Seville orange. 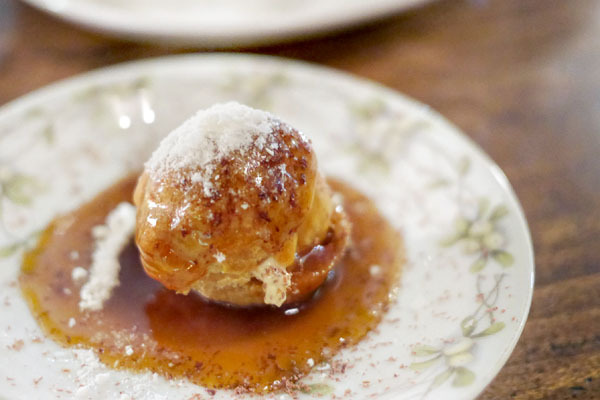 The restaurant's most notorious dessert, unsurprisingly, is the foie gras profiterole, which incorporates both foie butter and dehydrated foie. It really did showcase the earthy quintessence of the liver though, conveying its offal-y richness against a balance of sugary caramel and salt. 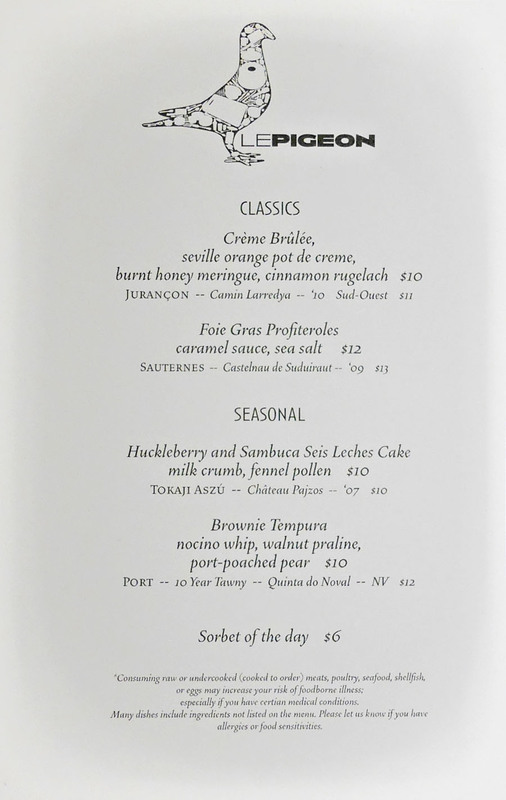 We've all had tres leches, but Le Pigeon turns the dial up to six with this version incorporating condensed milk, evaporated milk, regular milk, and coconut milk, with a crust of malted milk and powdered milk. 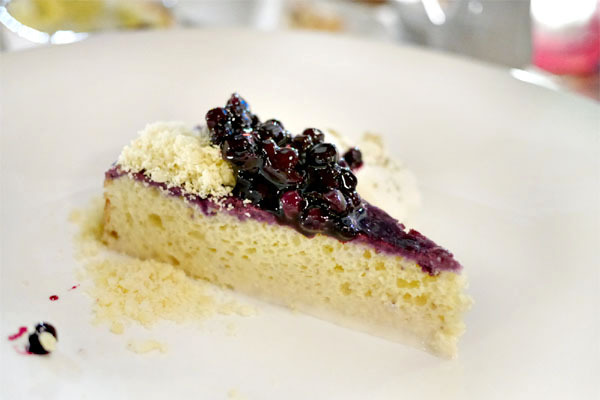 It managed to be my favorite of the desserts, a moist, creamy cake that nicely played classic flavors against the tartness of huckleberry. 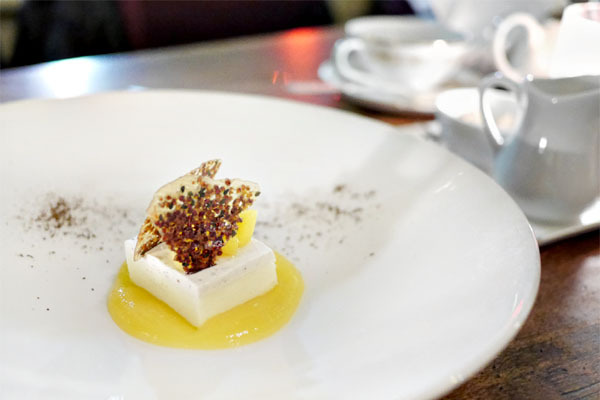 Last up was a "bonus" dessert, described as a Tokyo-style cheesecake with mango and elderflower. I rather liked it, finding the cake pleasantly restrained in its sweetness, with a tangy counterweight in the form of that mango. Lovely crunch from the quinoa tuile, too. 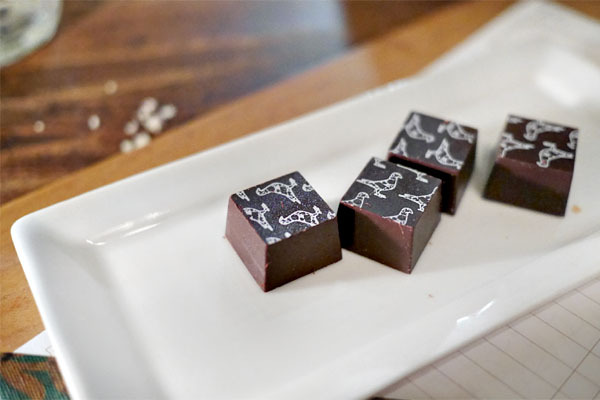 Finally, Le Pigeon-branded chocolates to close. Though the meal had a couple weak spots, I nonetheless walked away satisfied with Le Pigeon, making it a fitting way to wrap up my brief time in Portland. 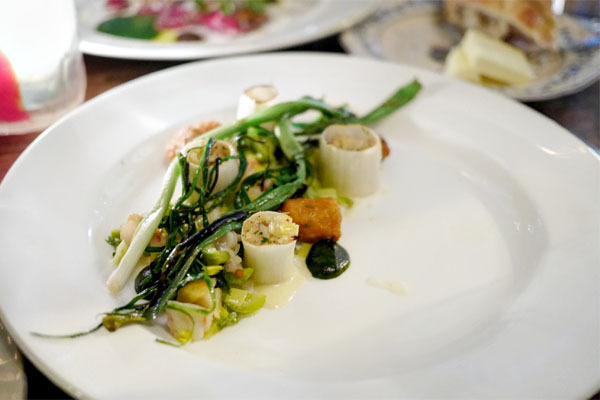 Rucker's cooking isn't exactly boundary pushing, but it is highly effective, fun, and tasty, sort of combining the best of French bistro fare with the bounty of the Pacific Northwest and his own nervy, oft-decadent style. There were some great flavors at play tonight, depth and balance too, making for a simultaneously serious, yet playful sort of energy that is obviously working for the restaurant. Give the place a go if you're in the area. Would love any comments you may have. Thanks.